Literably is a classroom tool that helps elementary school teachers monitor students’ progress in reading. Children read aloud to Literably and an audio recording is generated. 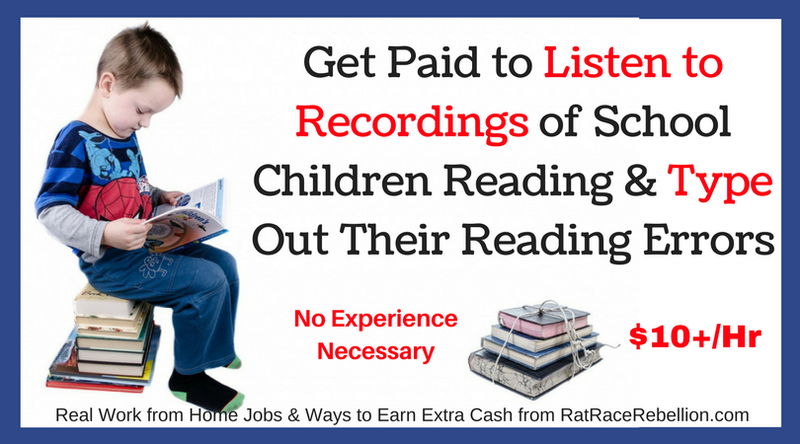 You, the Literably transcriber/scorer, listen to the recordings and type up every reading error the child makes. For example, if the child sees this sentence, “The dog ran after the blue ball,” and reads it as, “A dog ran af af after the blue ball,” you will document every error – no matter how small it may seem. Your accuracy is critical as the errors you note will help the schools to place children at a reading level that is appropriate to their true capabilities. Literably provides training, and pay is “over $10 per hour.” Naturally, the more you do, the better you get, the more you can make! Testing for the position involves scoring six sample recordings. To apply for these positions, click here. There’s a good video by a scorer here. We suggest watching it as it gives a solid overview of what a typical job looks like. It’s a little dated now, but still helpful. May you be working from home soon! This entry was posted in Hiring Companies, Work at Home Jobs and tagged Literably. Bookmark the permalink.